Ubermorgen. Group founded in 1999 by Hans Bernhard, Lizvlx, Alessandro Ludovico et Paolo Cirio. Wikipedia. > Amazon Noir - The Big Book Crime (2006). Installation. [Moulon] p. 68-69. > GWEI, Google wll eat itsef (2005) and several works in [Lieser]. > Child of Eden (2011). See Misuguchi. Uda Atsuko Japanese scientist on AI. Sbart Program. [Whitelaw]. Udagawa Masamichi . He formed the Antenna group in 1997 with Sigi Moeslinger. 8 pages in [Cameron]. Beautiful projections. Interaction through some sensors or Pal OS. > Wearable Forest (2008) by Ryoko Ueoka and Hiroki Kobayashi. Six pages and illustrations in [Bost-Crosetto]. Umeda Hiroaki. 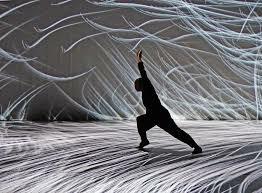 Dancer and choreographerr, combining performance and lights digitally controlled. > Split flow / Intensional Particle (2015). See an extract. Trustless Trust is the first part of his project "The Matrix". After having searched for biological properties of artefacts, he experiments the possible use of these artefacts by a distributed network of autonomous dynamic systems. These systems could use their own souvenirs... And so we would reach an operating mode independent and auto-regulated, contrasting with the capitalists systems elaborated in the 20th. century. Uqam. Université du Québec à Montréal. Uyttendaele Jeroen. Facebook. Sound research. < Circuit 02 (2013). Work in progress. < Vonkveld#3 (2013). Work in progress. Shown at Imal on spring 2013. < Leeway (2013) . Wall panel with circuits, as an interface. Ultra Fractal, software for fractal design, by Frederik Slijkerman. Umeda Hiroaki. Choreographer, interpreter, composer et video maker. Underground Sugar Cy . A group for performance, with some digital interaction, mainly done by Tatiana Vilela. > Ecume des Jours (2017). See the post. Undo Katerina Audiovisual and performance. Sound. > W/Hole Expansion (2016). An experiment with sensation and paradoxes. Overtoon. Un_drame_musical_instantane. 1970's. Three composers. since its creation in 1976, featuring Jean-Jacques Birgé, Bernard Vitet and Francis Gorgé, has decided to promote collective musical creation, co-signing their albums, which they consider as artworks in themselves, or their live shows which they try to renew every time they play. Unemi Tatsuo. Japanese scientist on AI. His publications are counted by hundreds. > Sbart program. They combine abstract forms and external documents (photographs). Ungauer Sylvie. Multimedia, but other genres also. > La maison à Brest (2008). L'unique. First French film with special 3D synthetic effects. Paris ACM Siggraph. UniversCiné. Video on demand for independent European cinema. - Labex Laboratoire d'excellence des Arts-H2H"
- ATI (Arts et technologies de l'image). - Arts-Sciences Symposium. Printemps de la Culture 2012. The program. - Laboratory Aizawa-Yamasaki and Graduate. - School of Interdisciplinar Information Studie. University of Tsukuba. Hoshino Laboratory. Un moment voulu. French association of contemporary art curators for public audiences. > Galleria Department Store (2004), by Ben van Berkel. Seoul, Korea. Quoted by [Lieser] with pictures. > Möbius House (1998). Youtube. Quoted by Terracol with picture for its geometry. Upgrade . International network of gatherings concerning arts, technology and culture. Urban A&O. Architecture and design cabinet. > Bone Wall (2006). Wall formed with moss cell, machine sculpted. Some pages in [Iwamoto]. Urbanska Jacques. Project Manager / Consultant: new media - digital media arts - art & networks - community management / Media artist. Urso Maria Donata d'. Leads the dance company Disorienta . Ursyn Anna. Compositing, landscapes. Her creation process. Starts from computer programming, then hand generation of objects. < Rondo (2005 c.) , Siggraph 2006. > Laser Beam Joint (1968). Quoted with a picture by [Bonnefoy] p. 390. The User. An art collective comprised of architect and installation artist Thomas McIntosh and composer and sound artist Emmanuel Madan. > Coincidence engines (2008) (up to 2011). Installations with alarm clocks and a lot of devices. Presented within "Québec Numérique" at Gaité Lyrique, Paris 2012. > Quartet for dot matrix printer (2004). Installation with printers. Presented within "Québec Numérique" at Gaité Lyrique, Paris 2012. Ushida Eisaku. A partner of Ushida & Findlay studio. Architects. > House for the third millenium (1994). Quoted by Terracol with picture and geometric explanations, for use of spiral and cone combined. Ussachevsky Vladimir. Musician. Wikipedia. Commented at length by [Baudouin]. UTC, Université de technologie de Compiègne (Technology University of Compiègne). Utterbach Camille and Achituv Romy. Writing on screeen. > Global City, for Saskia Sassen. Camille Utterback, Linescape.cpp , Golan Levin Axis by Martin Wattenberg Connection Study. > Text rain (1999) presented by [Paul], [Lopes] and Bootz (on line). 17 pages of comments and images in [Ricardo]. This work has been probably inspired by some aspects of Videoplace, by Myron Krueger (a major forerunner of interactive spaces, by the 1970's).